Trending this morning is a figure, 22,000, for the number of small cetaceans (dolphins and small whales) harvested by Japanese hunters each year (Link). This figure is inflated. The real figure is certainly less than 10,000, probably fewer than 3,000. Until the triple disaster of 11 March 2011, the bulk of the nation's dolphin killings were carried out by hunters working out of ports in Iwate Prefecture, with smaller numbers of killings carried out by boats departing from Miyagi and Hokkaido ports. The targets of these hunts were Dall's porpoises (Ishi iruka - Phocoenoides dalli), a small oceanic species. The hunt was conducted well offshore (meaning virtually no photographs or video record exist of it) with harpoons. 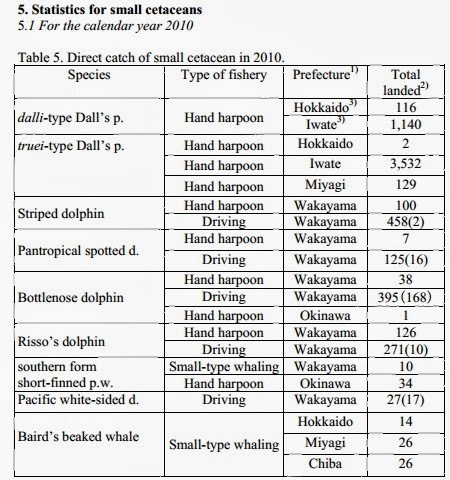 Below is the table, the most recent one available (Calendar Year 2010) of the total number of kills of various species of dolphins and small whales -- the latter term being something of a misnomer in the case of the Baird's Beaked Whale (Tsuchikujira - Berardius baidii) which is as big as the IWC-moratorium restricted Minke Whale (Minke kujira - Balaenoptera acutorostrata)*. Click on above image to open in a larger window. According to these government figures, the total number of small cetaceans killed in 2010 was 6,615. As the report explains the Dall's porpoise kill number is an estimate, based on the total weight of meat processed divided by a general figure of about 50kg of meat per porpoise. The number of dolphins killed outside outside the Dall's porpoise hunt was 1,696, with the bulk of that, 1,629 kills, being done by Wakayama hunters, almost all whom were probably were homeported in the infamous town of Taiji. When the tsunami wiped out the fishing gear and ports of Iwate and Miyagi, the Dall's porpoise hunt vanished (the tsunami also ended the Miyagi-based Baird's Beaked Whale hunt). The Dall's hunt has since struggled to reestablish itself -- see page 45-2 of this Japanese language only report from the Fisheries Research Agency. An enterprising journalist might want to ask the Reconstruction Minister what proportion of Tohoku reconstruction funds have been consecrated, if any, to reestablishing the Dall's porpoise meat industry. Assuming -- and it is an immense assumption -- that the Wakayama hunters managed to use up all their quota, and the hunters in prefectures outside the Tohoku used up theirs, the total number of small cetaceans hunted this fiscal year would be 4,177. To get some sense of how unlikely that is, the MAFF quota for Hokkaido harpooners is 1,221 Dall porpoises in 2013-14. In 2010, the last recorded year of the Hokkaido hunt, the number of porpoises taken was 116. Shizuoka hunters are permitted 250 kills under this year's quota -- yet no Shizuoka landings have been reported for over a decade. The 22,000 figure in the CNN essay is clearly wrong. Likely as not, it is wrong by an order of magnitude. Later - This post has been revised to include data from previous years's quotas for the Wakayama dolphin hunts. * Virtually all contemporary images and video of cetaceans being butchered come from the Baird's Beaked Whale hunt run out of Wadaura in Chiba Prefecture. This is due both to the community's relative proximity to Tokyo and its willingness to serve as a showcase for Japan's bid to resume small-scale coastal commercial whaling for Minke Whale.